The Hollywood studios have a fraught history with third-party services that re-edit their films, typically to remove the sort of content that had earned the film an R or even PG-13 rating. Back in the 1990s, a handful of video rental store operators, mostly in conservative Utah, began manually editing purchased copies of VHS cassettes for their customers as a service, most famously with Titanic, to remove the the naughty bits. Studios and filmmakers grumbled but manual re-editing wasn’t exactly a business designed to scale so Hollywood mostly let it be. In the 2000s, with the advent of the DVD format, some of those same entrepreneurs figured out ways to partially automate the editing process and tried to turn it into the business. In 2000, the Utah company CleanFlicks started producing cleaned up versions of DVDs created by muting the audio at key points or removing entire sections of the audio track, then offering them for sale and rental. This time the Motion Picture Association of America, along with Directors Guild, sued CleanFlicks on grounds that distributing the cleaned up versions violated the studios’ copyrights, and in 2006 a federal court agreed and ordered CleanFlicks to shut down. CleanFlicks was followed by ClearPlay, another Utah-based company, that developed a proprietary DVD player that automatically deleted the objectionable content during playback, thus avoiding the need to alter the DVD itself. The studios sued anyway, again on copyright grounds, but after the dispute attracted a spotlight on Capitol Hill Congress passed the Family Home Movie Act in 2005, which made it legal to develop technology to edit a movie during playback of a DVD or on the fly while streaming, so long as the technology did not alter the movie at its source or create an unlicensed copy. The new law effectively mooted the studios’ suit against ClearPlay, which remains in business, albeit now using software that integrates with GooglePlay and Amazon to filter streamed movies on the fly. The studios still may not love it, but to date they haven’t dared to challenge it. In the wake of the Family Movie Act, yet another Utah-based company, VidAngel, came up with a new twist on the formula. It created a system in which customers “purchased” a DVD virtually for $20, which remained with VidAngel. Users would then “play back” their DVDs from VidAngels’ servers, which used proprietary software to edit the movies on the fly. After viewing the movie, users could then “sell” the DVD back to VidAngel for $19, creating what amounted to a $1 pay-per-view rental. The studios sued again, claiming what VidAngel really amounted to was an unlicensed VOD service notwithstanding the nominal sale and repurchase process, and threw in an access-control circumvention charge under the Digital Millennium Copyright Act for good measure. In December, the studios won an injunction against the company from a federal district court in California, which put the freeze, at least temporarily, on VidAngel. That injunction is now under appeal to the Ninth Circuit Court of Appeals. The common theme throughout all of these disputes is that the studios have never legally challenged the substance of the edits made by the services directly (although DGA has). Instead, they have charged the services with one flavor or another of copyright infringement, giving them grounds to shut the services down without having to go on the record opposing the active filtering of their movies. This week, VidAngel called Verrilli’s bet. The company announced the launch of a new service for viewing cleaned-up streamed movies and TV shows that it claims avoids the legal infirmities of its original system and should therefore not be subject to the court’s injunction. Instead of the virtual sale and re-purchase of DVDs the new system is a cloud-based service that integrates with licensed streaming services and filters the content on the fly based on options set by the user. VidAngel relies on crowd-sourcing to tag movies and TV shows according to its filtering paradigm. Rather than integrating directly with a streaming service, as ClearPlay does, VidAngel asks users to provide their passwords for whatever service they already subscribe to. When the user requests a movie or TV show from VidAngel’s menu of tagged titles VidAngel’s servers then log on to the appropriate service using the user’s credentials and applies the filters as the movie streams. VidAngel CEO Neal Harmon said the new platform will initially support Netflix, Amazon and HBO Now, with Hulu, iTunes and Vudu to follow. The company is now asking the court to rule on whether the injunction applies to the new platform. If the court rules the new service falls outside of its infringement-based injunction it could blow the studios’ cover, and force to declare just what it is about VidAngel’s business they really object to. Is it the filtering, or merely the infringement? One tell will be whether the studios try to pressure Netflix and Amazon to block VidAngel from access those services. Neither has said anything yet about the new platform, but they could conceivably block VidAngel on grounds that its users are violating their terms of service by sharing their passwords, or by making up some other grounds. Given Netflix’s history of lax enforcement of password-sharing, however, it’s hard to imagine that would be something it would initiate itself. 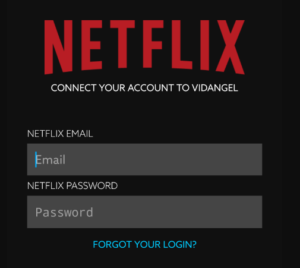 If Netflix suddenly cracked down on sharing passwords with VidAngel it would be a fair bet it wasn’t their idea. Your move, Hollyood: Raise, call, or fold.